1) Volume: How often do you plan on using the machine? 2) Fold Types: What types of folds do you need this machine to perform? 3) Paper Types: What kind of paper do you plan to fold? 4) Programmable Memory: Will you have multiple recurring folding jobs? Programmable Memory makes it possible to record or “program” the details of any given job, therefore, reducing future set-up time and improving overall efficiency. In addition, you will need to decide whether your work load requires a friction fed paper folder or an air fed paper folder. A Friction Fed Paper Folder uses rubber rollers to grab and insert the paper into the folding machine. This is the most commonly used type of feeding system, and works great for offices and production facilities / print shops. One of the most popular friction-fed paper folding machines is the Martin Yale 1611 Ease-of-Use AutoFold Paper Folder, which is perfect for large mailrooms and offices in need of high output rates in a short amount of time. 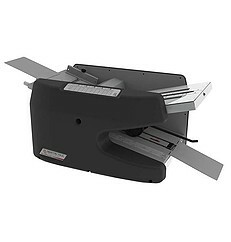 The Martin Yale 1611 Ease-of-Use AutoFold Paper Folder can handle a variety of your paper folding needs. The 1611 Folder is a high speed machine that automatically feeds and folds documents that are 8 1/2″ x 14″ in size and the feed tray can hold between 16 to 70 pounds of paper. This machine can create five standard folds: letter fold, half fold, z-fold, double parallel fold, and right-angle fold. There is no fanning needed when you use the Martin Yale 1611 AutoFolder all you have to do is put the paper in the machine and it automatically folds to the desired fold type. The conveyor exit table makes it convenient and easy to handle folded stacks. The 1611 Paper Folder features automatic jam detection as well as an automatic shut-off for operator protection, which will extend the longevity of the machine. It measures only 17-1/5″H x 20-3/5″W x 14-1/5″D, so it can fit on almost any desk or work space. The Martin Yale 1611 Ease-of-Use AutoFolder Paper Folder can fold as many as 9,000 sheets per hour and it is the ideal paper folding machine for large mailrooms and offices where production speed is important. This paper folder comes standard with a one year manufacturer’s warranty on all of the parts. If you have any questions or are interested in purchasing the 1611 Ease-of-Use Paper Folding Machine, visit SpiralBinding.com. We have great pricing on a full line of Paper Folders. Call us at 1-800-631-3572 for more information.